It’s always amazing to see a new company revive an old name. It’s happened a few times since the United States lost access to the Cuban tobacco market, these old names in cigars just going under, and for the most part, it’s not much of a loss. 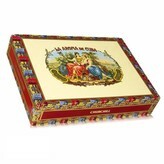 But when La Aroma De Cuba fell apart, that was a big loss for all. That was the cigar brand that Winston Churchill is said to have favored. That was the cigar brand that was enjoyed by one of the greatest leaders that Great Britain ever had when he was turning the world around! Thankfully, through the efforts of Robert Levin and Don Pepin Garcia, the name has been well and truly revived. The cigars are made in Esteli, Nicaragua, at the factory of My Father cigars, and they are a quality smoke indeed. The best tobaccos in Nicaragua are blended together, and then wrapped in a Connecticut Broadleaf wrapper to give it a bit of sweetness and spice. When lit, the cigar is flavorful and pleasing to all the sense. The wrapper is a beautiful and chocolate shade of brown, one that will impart a bit of cinnamon and sweetness to the smoke, while the tobacco tastes of earth and cedar notes, creating a full-bodied and full-flavored cigar that anyone who enjoys a darker cigar will be a fan of. Being able to have twenty-five such cigars, all housed in a black box, is a great gift, and they will be a constant companion to anyone who enjoys a darker and richer smoke.